An old fashioned garden plant or herb, is commonly called Wall Germander. It is grown for the aromatic foliage as well as the attractive tubular pink to purple flowers that cover the plant for long periods. This is a plant from Mediterranean areas, it was used as a medicinal herb, however it is as a cottage garden plant that is popular. Another great plant for the dry areas of the garden. 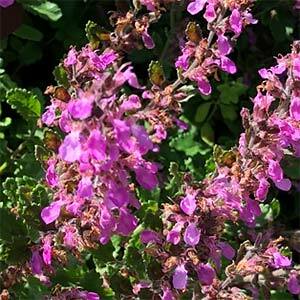 Teucrium chamaedrys requires little care and is not that fussy about soil quality, however it will perform a little better in good soils. Grow it along with lavender, agastache and other shrubby perennials, its good green foliage contrasts well against the silver foliage plants, it can also be used in low growing knot gardens. Flowers – Pink to purple. Pruning – Dead head to encourage more flowers, Prune back after flowering by 1/3rd.